Patience is a virtue for ORACLE TEAM USA who, after two anxious days, finally get the green light to commence sailing trials on their new AC72. All systems were go, and "17" quickly took to flight during her maiden voyage on San Francisco Bay. Hear from the ORACLE TEAM USA crew what it's like to fly their AC72 "17" on foils, sometimes at speeds of over 40 knots, and experience the sensational acceleration from onboard. A coelacanth poses for its portrait in South Africa's Sodwana Bay. In the deep sea, slow and steady wins the race—and that proverb is reflected in the genes of the coelacanth (Latimeria chalumnae), a new study says. Following the discovery of coelacanths in Jesser Canyon caves off Sodwana Bay, Kwazulu-Natal, in October 2000, the diver and naturalist Laurent Ballesta, accompanied by a team of deep-sea divers, is looking -120 meters below the surface- for 'gombessa' this peaceful 2 m long giant, thought to be extinct for 70 million years and rediscovered alive in 1938. When the study authors sequenced the ancient fish's genome, they found that its genes have been evolving more slowly than the genes of the other fish or terrestrial vertebrates they looked at, including sharks, chickens, and lungfish. - It is, with its lobe-like fins and primitive lung, a living and unexpected relic of the sea some 370 million years ago. In the paper, published April 18 in the journal Nature, the researchers speculate that the coelacanth's relatively unchanged deep-sea habitat, and an apparent lack of predation over thousands to millions of years, means this ancient fish didn't need to change much to survive. Coelacanths live as deep as 2,300 feet (700 meters) below the sea surface, and can reach 6.5 feet (2 meters) in length. Often referred to as a "living fossil," the coelacanth looks remarkably similar to its fossil relatives from 300 million years ago. Scientists had thought the coelacanth (pronounced SEE-la-kanth) had gone extinct about 65 to 70 million years ago until a researcher stumbled on a freshly caught specimen off the coast of South Africa in 1938. And since its discovery, about 300 individuals have been recorded in two areas in the world—near the Comoros Islands (map) off the eastern coast of Africa and in the waters near Sulawesi, Indonesia (map). A second living species of coelacanth, Latimeria menadoensis, was also discovered in 1997 off the coast of Indonesia. In France a solo woman and a men's duo are preparing to paddle and row a partial route of the Northwest Passage in the north of Canada and Alaska. Experienced ocean rower, Anne Quéméré is quite busy with the preparation at the moment, she told ExWeb. According to her website she plans to paddle 3000 km in a Grand Narak kayak. "This kayak is equipped with a rudder - in order to correct the drift due to the wind or the current – which can be fold on the rear deck during transport or when paddling in not very deep water. It is controlled with both feet thanks to a system of pedals and cables. Finally, its carrying capacity convinced me in my final choice." Depending on the sea ice her route will stretch from Pond Island, Baffin Island, west to the Pacific Ocean. Meeting Anne on their way east, Charles Hedrich and Pierre-Marie Bazin plan to start mid-June from Nome, Alaska, and row to Pond Inlet; a 6000 km voyage, Hedrich says on his website. They expect to be 3-4 months at sea. 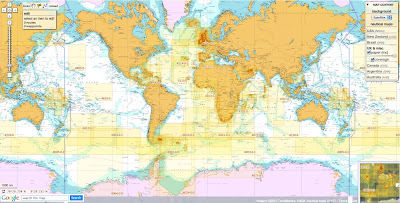 So today, for a cost of 9.9 € / month ('Premium Charts' subscription), you can have access to 2588 additional updated charts (4332 including sub-charts) coming from 3 international Hydrographic Services (UKHO, CHS, AHS and France). Who, what, why: why build a ship tunnel? The Norwegian government has backed an ambitious plan to create the world's first ship tunnel. But why has nobody tackled this engineering feat before? At 45m high (148ft) and 36m (118ft) wide, the 1.7km (one mile) long Stad Ship Tunnel will be the only one of its kind - a passage through solid rock able to accommodate 16,000 tonne freight and passenger ships. 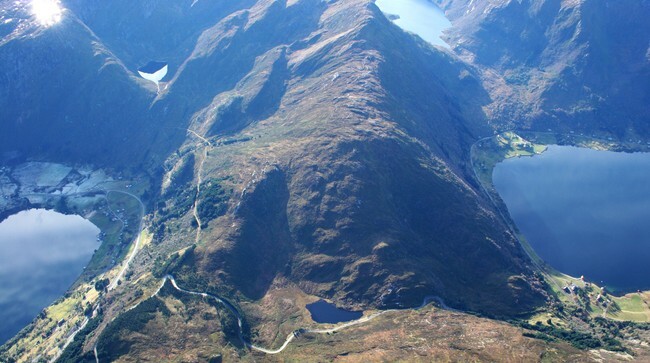 Ship canals have long been used to make journeys more direct and safer but the Stad peninsula is a mountainous divide, peaking at 645m, between the Norwegian Sea to the north and the North Sea to the south. Norway has a reputation as the world-leader in tunnelling. They have already achieved the world's longest road tunnel. While it will be the first proper ship tunnel, the engineering behind it will not involve radical innovation. Instead of carving out a slice of the landscape for a canal, engineers will drill and blast through the rock at sea level before removing the dams so the sea can flood a 12m (39ft) deep channel for ships to travel in. "It isn't an unheard of challenge, it involves building a cofferdam [a watertight enclosure] at either end to keep the water out until excavation is complete," explains Robert Benaim, Fellow of the Royal Academy of Engineering. The Stad peninsula on Norway's western coast is notorious for heavy weather that can endanger ships - the country's highest wind speeds are commonly recorded on the promontory and ships are routinely delayed by stormy conditions. A recent review also found 46 accidents and near-accidents and 33 deaths had occurred in the waters since the end of World War II. Randi Humborstad, project leader at Nordfjord Vekst, the organisation behind the tunnel plans, cites a 161-passenger cruise ship that was almost shipwrecked in 2004 as further evidence of the area's fierce conditions. The tunnel is not to save time. It will take as long to go through it as it would take to go around, admits Humborstad. But taking the weather out of the equation will improve safety and trade links in the area. In a country where the shipping industry is the second most important after gas and oil, the tunnel makes sense, Humborstad suggests. "As the sea is the backbone of transport along the west coast of Norway, public transport could be upgraded with improved regularity in cargo services and a new year-round high-speed passenger ferry service between the coastal cities of Bergen and Alesund." Despite its unique size and location, the tunnel is "not of massive engineering significance", according to geo-technical engineer Prof David Richards from the University of Southampton. Richards compares the ship tunnel to existing canal tunnels, the only difference being scale and the resulting expense involved in drilling out and disposing of such sizeable rock spoils. It is the expense that has kept the project on the back-burner since it was first dreamed up in the 19th Century. The budget is an estimated 1.7 billion kroner (£193 million). Since the ship tunnel plan began to gain support in the 1980s, there have been 18 separate studies to assess whether it offers value to society. There are still question marks. According to Prof Knut Samset at the Norwegian University of Science and Technology, who has conducted research into the project, the tunnel is "far from economically viable". Despite the government's backing, the plan must still be approved by parliament. In Norway safety and trade concerns may justify the spending of millions. But the world's first ship tunnel may not see a competitor from elsewhere in the world any time soon. The longest canal tunnel in the world is France's Rove tunnel which links the port of Marseilles with the Rhone river. Opened in 1926, it is 4.45 miles long but has been closed since 1963 after part of the roof collapsed. At 3.25 miles, Britain's longest canal tunnel is Standedge in the Pennines. It was closed in 1943 but reopened in 2001 after a programme of restoration. The documentary provides surprising details about the pirate trade and why they do what they do. Piracy on the world’s seas has reached a five-year low, with 297 ships attacked in 2012, compared with 439 in 2011, the International Chamber of Commerce (ICC) International Maritime Bureau (IMB) global piracy report revealed today. 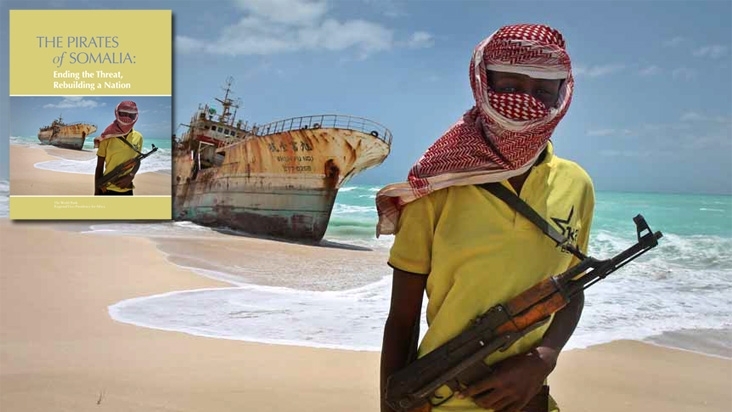 Worldwide figures were brought down by a huge reduction in Somali piracy, though East and West Africa remain the worst hit areas, with 150 attacks in 2012. Globally, 174 ships were boarded by pirates last year, while 28 were hijacked and 28 were fired upon. 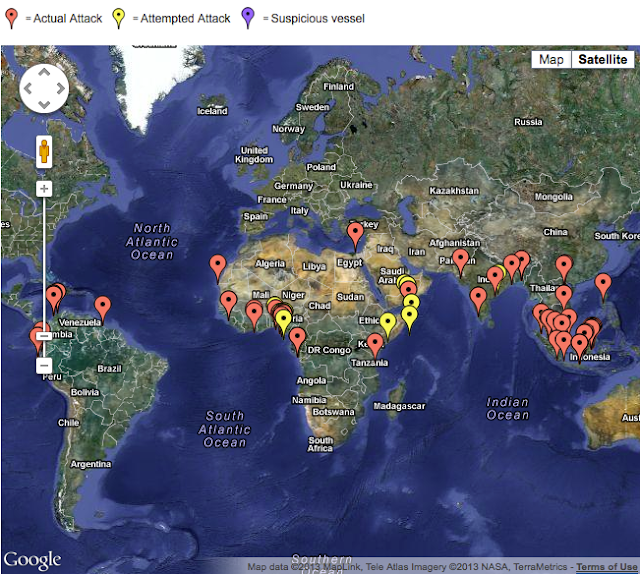 IMB’s Piracy Reporting Centre also recorded 67 attempted attacks. The number of people taken hostage onboard fell to 585 from 802 in 2011, while a further 26 were kidnapped for ransom in Nigeria. Six crewmembers were killed and 32 were injured or assaulted. “IMB’s piracy figures show a welcome reduction in hijackings and attacks to ships. But crews must remain vigilant, particularly in the highly dangerous waters off East and West Africa,” said Captain Pottengal Mukundan, Director of IMB, which has monitored piracy worldwide since 1991. This map shows all the piracy and armed robbery incidents reported to the IMB Piracy Reporting Centre during 2013. If exact coordinates are not provided, estimated positions are shown based on information provided. In Somalia and the Gulf of Aden, just 75 ships reported attacks in 2012 compared with 237 in 2011, accounting for 25% of incidents worldwide. The number of Somali hijackings was halved from 28 in 2011 to 14 last year. IMB says navies are deterring piracy off Africa’s east coast, with pre-emptive strikes and robust action against mother ships. So too are private armed security teams and crews’ application of “Best Management Practices”. But the threat and capability of heavily armed Somali pirates remains strong. “The continued presence of the navies is vital to ensuring that Somali piracy remains low,” said Captain Mukundan. Pirate mother ships and skiffs were reported in the Gulf of Oman, southern Red Sea and the Somali basin, with a number of attacks close to the Straits of Hormuz and the energy routes out of the Arabian Gulf. As of 31 December 2012, Somali pirates still held 104 hostages on eight ships and 23 more were detained on land, pending negotiations for their release. In Somalia, and elsewhere, vessels most commonly attacked are container ships, bulk carriers and tankers loaded with oil, chemicals and other products. Fishing vessels and other smaller boats are also at risk. As for West Africa, piracy is rising in the Gulf of Guinea, with 58 incidents recorded in 2012, including 10 hijackings and 207 crew members taken hostage. Pirates in this area are particularly violent, with guns reported in at least 37 of the attacks. Benin is an exception, showing a sharp fall from 20 incidents (including eight hijackings) in 2011 to two (including one hijacking) in 2012. Nigeria accounted for 27 incidents in 2012, with four vessels hijacked, 13 vessels boarded, eight fired upon and two attempted attacks. Only 10 incidents were reported in 2011, including two hijackings. Togo has also seen an increase from five reports in 2011 to 15 in 2012, including four hijackings. Off the Ivory Coast, five incidents were reported in 2012, up from one in 2011. In the last quarter of 2012, a panamax product tanker was hijacked by suspected Nigerian pirates off Abidjan, the first such recorded vessel hijacking off the Ivory Coast. This shows the increased range of Nigerian pirates. operates a group called the Joint War Committee. 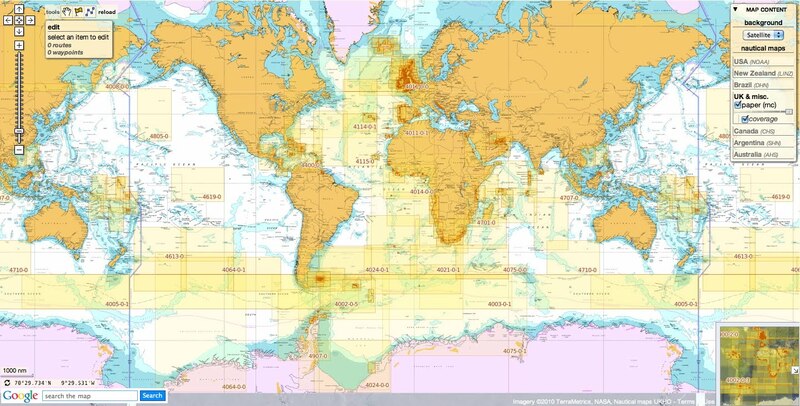 It's in charge of determining the most dangerous ports, shipping lanes and coastlines in the world. Earlier this year, the JWC updated its list of hotspots. And research firm Control Risks has sent us a killer map showing where they're located. Elsewhere, in Southeast Asia four vessels were hijacked, including a Malaysian tanker which was subsequently recaptured in Vietnam in the last quarter of 2012. Across the Indonesian archipelago, there were 81 reports of petty theft, accounting for more than a quarter of global incidents in 2012. Thirty vessels were attacked in the last quarter of 2012. Reports from Indonesia have increased yearly since 2009. Vessels were boarded in 73 incidents and 47 crew members taken hostage. Fourteen incidents were reported at Belawan by ships anchored or berthed. On introducing a new interactive flood mapping website, www.NJFloodMapper.org, Lisa Auermuller, watershed coordinator for the Jacques Cousteau National Estuarine Research Reserve, acknowledged that playing with the controls and seeing the implications of an increasing sea level rise on their communities might not be something those affected by Superstorm Sandy may want to do anytime soon. But the website and sea level rise are important for elected and appointed officials to contemplate while planning for the future. “We have been giving communities the following figure: Plan for 1 foot of rise by 2050 and 3 foot rise by 2100. It’s not like storm surge where it comes and goes; this is what the water level will be permanently at mean high tide,” she said. Although some still balk at the idea of climate change and sea level rise, Auermuller said climate scientists no longer quibble on that point. “There’s no question that sea level rise is a reality along the Jersey coast,” she said. “This is scientific fact. It’s not political, but it’s become political,” she noted. The website has been developed over years starting with a grant JCNERR received from the National Oceanic and Atmospheric Administration in 2009 and was specifically built to be used by local and state planners when making land decisions. The map was developed through a partnership with the JCNERR and Rutgers Center for Remote Sensing and Spatial Analysis. It’s Goggle Maps-based but informed by LiDAR technology, the most sensitive typographic mapping there is. Not only is the sea level rising, the land is sinking, said Auermuller. “In New Jersey we have a double whammy; we have subsidence at the same time. Ground water withdrawal is one reason for subsidence, and the soils we build on get compacted over time, so we are exacerbating the problem over a geological time frame. Also, as water temperature is heated, it expands and makes the level higher. And then there’s the whole melting ice sheet thing that is not at all local but does play into the connectedness of the ocean. The NJ Flood Mapper shows the current mean high water mark (an average of all the high tides in a year) and then shows what happens as sea level rises. “This is not storm surge,” noted Auremuller, although there is a tab on the website that shows the effects of Sandy. “It shows what will happen – up to a 6-foot rise in the future. “I’m saying ‘will’ because many of my colleagues and many climate scientists no longer argue about whether this is happening. A graph of a tide gauge in Atlantic City dating from 1900 up to 2013 shows a 1.5-inch-per-year increase, or 1.3 feet in 100 years. Auermuller said some Rutgers and research reserve staff serve on the Federal Emergency Management Agency’s Coastal Outreach Advisory team, but did not provide input to making the FEMA maps. Their job is like public relations, getting the message of sea level rise to the public. “If the message is too technical, you have to make that more clear. The information on this website is a way to get that information out, but we did not have a hand in developing the FEMA map information. When launching the map of the whole state, note the six tabs at the top left. One shows how much of the coastal state is currently inudated during mean high water (average of the highest high tides over a year) and then what happens as you add 1 foot of rise here. Roads are flooded, and if you increase the mean high tide level up to 3 feet, as projected in 2050, many communities are underwater. “You can play with this up to 6 feet. On Long Beach Island, only the beachfront dunes are still there,” she noted. Six feet of storm surge is not the same thing. This is a constant sea level rise, and storm surge has energy behind it. “The confidence tab lets people understand that this is based on a model. In a model you are not showing perfect science. With the sea level rise we want to be upfront to say we are pretty confident, 80 percent confident, that sea level rise will look like this; other areas have less confidence. The map can be useful during a storm, but it’s really for future planning. “If you know your most socially vulnerable populations are also in an area of the most vulnerable areas for rising sea level, then you can make decisions as a community and factor that into your master plan. The flooding tab has information that has evolved since Sandy. “The A- and V-zones are mapped, and we can also add the extent of Sandy inundation to show how far inland the water went. When people are thinking about planning, we know that Sandy is going to be a factor. “Without putting a value judgment on this, if you look at the A- and V-zone designations – and most of Mystic and Tuckerton Beach are in the V-zone now – and then overlay Sandy, it’s really apparent that the maps may not be that far off. “During storm surge, I heard people were seeing 3-foot waves in the back bays. If communities are looking toward the planning horizon, they can think about Sandy and visually see it. “Our last tab is this marsh tab. And in the face of sea level rise, marshes have a few options: They are either going to be able to keep pace with the rising water and stay above the water level, or they are not and they will drown. We don’t have any sediment coming to our marshes anymore, so the idea of them being able to keep pace with sea level rise is somewhat unlikely. There’s a lot more information on the site and links to other sites for the curious mind to explore. There is a link on the website to case studies from places such as New England and Delaware on how communities have been working with their residents to think about climate change and sea level rise and plan for it: pass ordinances or account for these conditions when building a new wastewater treatment plant or other infrastructure, said Auermuller. 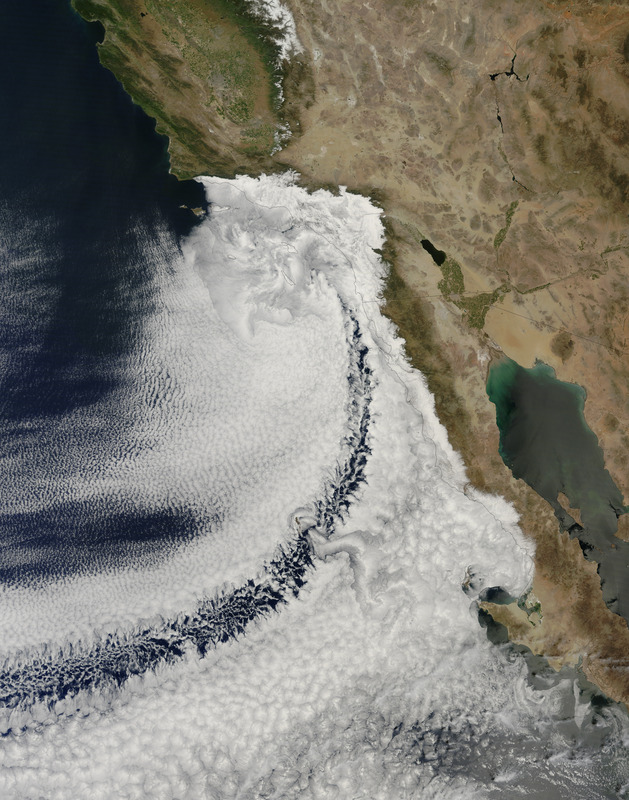 On April 14, 2013, the Moderate Resolution Imaging Spectroradiometer (MODIS) on NASA’s Terra satellite observed a striking cloud formation off the California coast. A cloudbank hugged the coastlines of California and Baja California, spanning hundreds of kilometers north to south and east to west. Within the cloudbank was an arc of mostly clear sky. Curving toward the southwest, the arc extended more than 1,000 kilometers (600 miles) over the Pacific Ocean. Bob Cahalan of NASA’s Goddard Space Flight Center explains that the cloudbank consisted of stratocumulus clouds, and the arc was probably a wake caused by an obstacle to air flow, perhaps San Clemente Island. Islands that are tall enough can easily interrupt air flow over the ocean, and when clouds are present, they make such disruptions visible in photo-like imagery. Wakes from the Juan Fernandez Islands off Chile provide another example of this phenomenon.